In the late 1960s, the Denver & Rio Grande Western wanted to abandon the narrow gauge San Juan Extension between Antonito, CO, and Durango, CO. While the Silverton Branch still had a decent tourist business, the rest of the narrow gauge route had little to no traffic. The combined efforts of a group of citizens and the states of Colorado and New Mexico lead to the purchase of 64 miles between the end of standard gauge at Antonito, CO, and the station of Chama, NM. 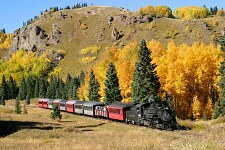 This was considered the most scenic section of the line (other than the Silverton Branch), as it passed through the Toltec Gorge and over Cumbres Pass. Thus was born the Cumbres & Toltec Scenic Railway. Since 1974, the railroad has managed by the Cumbres & Toltec Scenic Railroad Commission, an interstate agency to which both Colorado and New Mexico contribute two board members. Day to day operations contracted out to an operator - currently, this is the Rio Grande Railway Preservation Corporation. 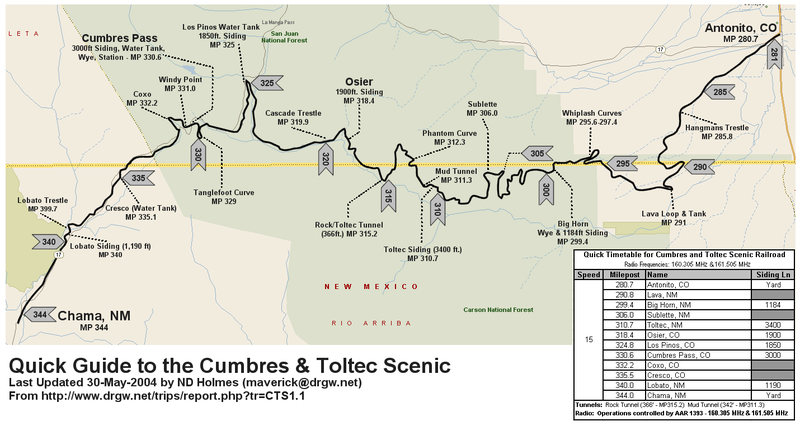 In addition to both of these entities, there is a third critical piece - the Friends of the Cumbres & Toltec Scenic(FOTCS). This is a non-profit group of volunteers whose mission is (from their website) "preserving all of the railroad�s historic assets that are not used in the regular tourist train operation, and interpreting the railroad to the public." See a route map and guide to riding and railfanning the C&TS. The C&TS converted to an NXDN-based digital radio system in May 2014. Analog scanners will no longer work for railfanning the C&TS.